Arch. Jerzy Szczepanik, founding partner of JEMS Architekci, will be a guest speaker at RIFF Warsaw 2016, with a presentation on their International Congress Center project. 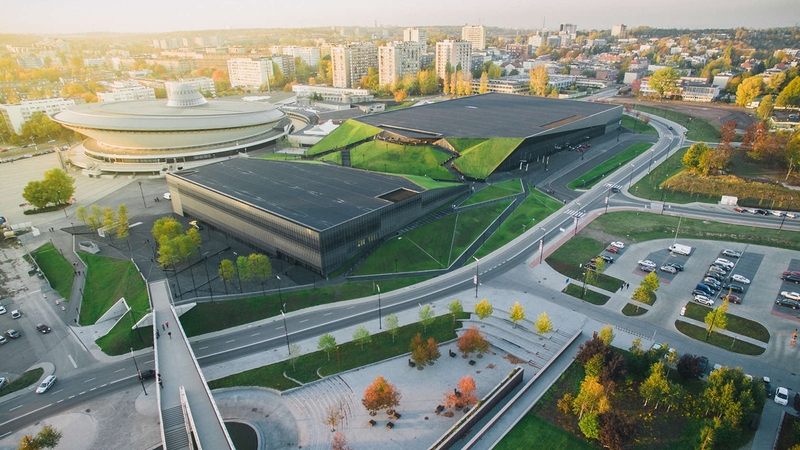 The Katowice International Conference Centre project situated nearby the Spodek arena erected in 1962 posed a challenge in both urban planning and architectural terms. 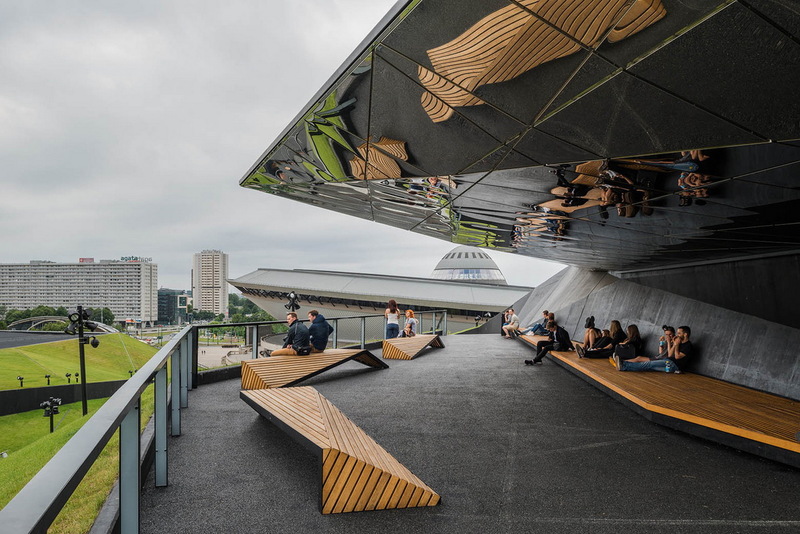 The general philosophy behind the design was to create a facility with a value created not only by providing functional solutions of a utilitarian nature, but also by creating conditions for its existence within the social space of the city. The Centre building, with its straightforward, distinct and clear-cut form, has been integrated into the public space of the city through links provided along the city’s key axis connecting the “honorary” square in front of Spodek (also the main traffic node of Katowice) and the city’s oldest, historic district of Bogucice. The links are implemented in a two-fold manner: in the form of a public passageway across the main hall and foyer of the Centre (a link to be used especially during open events, such as fairs or exhibitions) and in the form of an external route running over the building roof (green valley), which may be used throughout the year for events such as outdoor exhibitions or happenings. This philosophy has led to the formation of the building, its core composition elements being the roof (green valley), integrated into a system of land slopes and natural diversity of terrain, and the hall/foyer space below, taking advantage of the ceiling deformation as a unique feature, a negative of the “green valley” form. The structure shaped this way meets both the expectations arising from its importance and prestige, and from the need to make it an inherent part of the landscape surrounding the Spodek Arena, which will remain a dominant landmark within the space of this part of the city. Jerzy Szczepanik-Dzikowski – architect, born in Lublin in 1945. Graduated from the Faculty of Architecture, Warsaw University of Technology in 1972. In 1984 – 1987 President of The Warsaw Chapter – Union of Polish Architects SARP. In 1984 – 1989, ran an autonomous architectural studio together with Olgierd Jagiełło as part of the ESPEA cooperative. Since 1988, founding partner of JEMS Architekci. În 2001-2005 Secretary of Polish Chamber of Architects Since 2010, supervisor of diploma projects at the Faculty of Architecture, Warsaw University of Technology. Winner of the SARP Honorary Award 2002. JEMS Architects was founded in 1988. The team though had been working together since the early 80s. Starting up as an independent practice at a time of democratic change in Poland, JEMS joined the push for the restoration of a Polish architectural culture. The cooperation of the partners matured in an office/workshop formula, offering an inspiring space for an exchange of a variety of ideas and views. Architects, Olgierd Jagiełło, Paweł Majkusiak, Maciej Miłobędzki, Marek Moskal, Andrzej Sidorowicz, Jerzy Szczepanik-Dzikowski, Marcin Sadowski and Wojciech Zych – Chairman of the Board and responsible for financial and legal matters, form the core of the office, manage and coordinate the work of the architectural teams in conjunction with various other specialized design offices. During the last 25 years, JEMS has grown from a small design office into a 60-strong team of architects. In 2008, JEMS moved into their own purpose built office, which is situated in Warsaw on Gagarina Street. The JEMS architects are guided by a regard for reality both as the subject of their creative attention and also as the framework for their activities. They endeavor to read reality’s complexity through a filter of culture, history, tradition and the context of place. They seek inspiration in their reading of this multi layered impression of reality, as well as in the limitations and conflicts inherent in their times. They venture into areas which at times offer no opportunity to formulate a quick or, unequivocal and synthetic response to the design problem. They have never aspired to a ‘universal method – strategy’. They are guided by experience, amassed over the years and by their intuition honed by time. They find the images, associations, feelings, and rules along the way. Along the way they make discoveries which surprise them. It is these discoveries which give meaning to their efforts. The JEMS office is a place for open discussion and debate. The ideas thus generated are the result of these talks and research where different views and opinions meet.